Bible search, daily Bible verse, Bible study, and quiz applets. Also offers web hosting. Narrative of creation and of Jesus life paraphrased from the Bible. Guide to salvation and information about Jesus, God, heaven, Christianity and the Bible. Includes some humour. Historical site which contains links to articles on the Lord Jesus. Scripture based answers to lifes questions about Christianity, Jesus and the Bible. Includes personal stories. Courses entitled Mark, Acts, Jesus is Lord, and Following Jesus. Online or by e-mail. Introduces people to the Person of Jesus Christ, the gospel of salvation and bible study tools. It contains articles on apologetics, spiritual warfare and apostasy. Bible studies, kids page, Bible women, and novel about people who met Jesus. Salvation explained, a Bible quiz, and online KJV Bible. Good news of Jesus Christ, gospel articles, Bible studies, and multilingual Bible verses. Discipleship guides for new believers, salvation assurance, and Bible study skills. Bible study series on Psalm 91 and the character of Jesus. Online KJV Bible, gospel parallels for Jesus life, reading plans, and Bible verses by topic. Dedicated to the sole purpose of directing questions of those wishing to obey the word of God to scripture in the Holy Bible. Claims that the pure spirit of Christianity, as expressed in the King James Bible, has been corrupted by everyone from the Catholic Church to Billy Graham. Includes book on salvation through faith in Jesus, in PDF or Word format. Summary of Jesus teachings, Biblical wisdom explained, Bible quizzes, and word search puzzles. Features salvation quiz, prayers for seekers, believers and sinners, inspirational stories about God and Jesus Christ, links to Christian Bible studies and information about heaven and hell. Free Bible study software for Windows. Program presents the gospel of Jesus Christ. Bible coding on shirts and tracts, a code search game, and an interactive invitation to receive Jesus. Mailing list with new devotionals almost every day. Based on a Bible verse with inspirational quotes chosen from many years of reading through various study & devotional Bibles. Emphasis on relationship with Jesus. Argues that Jesus did not speak of homosexuality and Bible passages are open to different interpretations. Centrality of Jesus in the Christian life. Studies include Christ in the Old Testament, lives of Abraham, Isaac, Joseph, Moses, David, eternal security, spiritual warfare in Nehemiah, and the book of Ruth. Two essays: one concerning the trustworthiness of the bible and one devoted to proving the existence of God. Five Bible studies for new believers covering basic topics: God, Jesus, the Holy Spirit, Gods word, and life in Christ (Chinese, Hindi, and English). Five articles on the methods and findings of the Jesus Seminar - naturalistic assumptions, Jesus uniqueness, the resurrection, the reliability of the Gospels, revisionist views of Jesus. Articles by Dr. Greg Boyd. Seven interactive Church of Christ Bible lessons introduce students to Jesus, the church and the way to eternal salvation. Religious survey about Christian beliefs and the second coming of Jesus Christ, plus a prophecy section that features a daily Bible verse, the latest world headlines, and Bible prophecy teaching. Answers to alleged Bible contradictions and scientific problems, creationism information, information on cults, and apologetics for teens as well as a timeline of Christian broadcasting, Bible facts, links, and an explanation of how to know Jesus. Explores the life of Jesus Christ. Who is Jesus? Is He God? Am I in need of a savior? Comparison of Jesus and Muhammad, inspirational stories, and links. If the business hours of Heaven Awaits in may vary on holidays like Valentine’s Day, Washington’s Birthday, St. Patrick’s Day, Easter, Easter eve and Mother’s day. We display standard opening hours and price ranges in our profile site. We recommend to check out heavenawaits.com/ for further information. 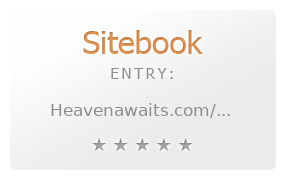 You can also search for Alternatives for heavenawaits.com/ on our Review Site Sitebook.org All trademarks are the property of their respective owners. If we should delete this entry, please send us a short E-Mail.